I was quite relieved to see the cork emerge from this bottle pretty much intact. The 1947 Cheval Blanc is one of the world’s most rarified wines, so expectations were naturally running high. 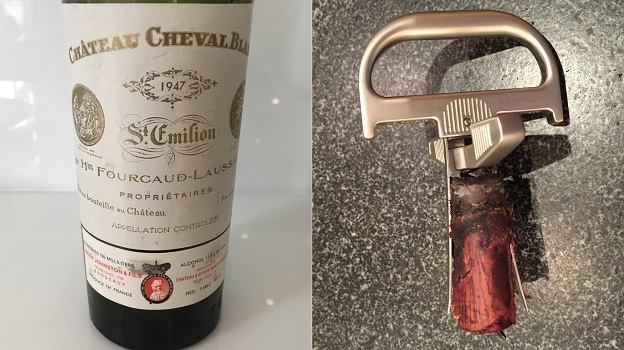 Almost unnaturally dense for a wine of its age, the 1947 Cheval Blanc possesses stunning richness and viscosity. Prune, mocha, dark spices, soy, espresso, leather and licorice from an exotic tapestry of aromas, flavors and textures in a wine endowed with sense of port-like richness and unctuosity. My only regret is not having known the 1947 as a young wine. It must have been utterly magical. Today, it is still outstanding, but a bit past the stage where I personally find the greatest pleasure in wine. Still, the depth and palate intensity are truly remarkable. Notes: Château bottling, slightly low fill. 96/Drink now.